“We have a lot of people [in New Orleans] who, on a regular basis, cook very good food — wonderful food — within the Creole cooking tradition, and that’s the tradition I know. This port, New Orleans, which so much came from — you had the West Indian and Caribbean influences, the African influences, the French and Spanish cooking traditions, the Isleño cooking traditions, and then the Italians. For a long time, in the Seventh Ward, you had Italians and Creoles living together, sharing a lot of their cooking traditions. And the paneed meat, which I’m going to do today, has those influences mixed in. 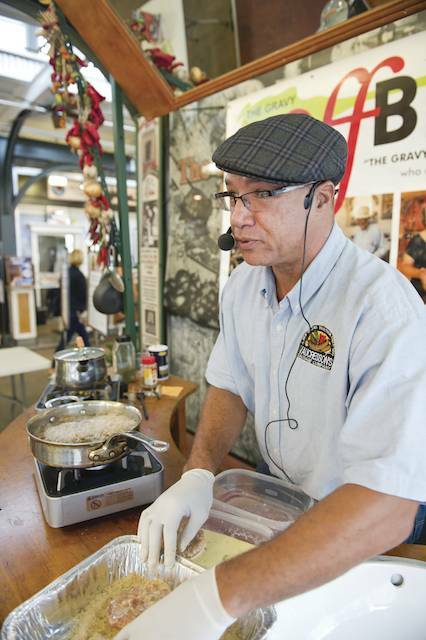 The Sausage King Vance Vaucresson spices up alligator in The Gravy (photo Elsa Hahne). My aunts were some of the best cooks. Honestly, my mother was not the greatest cook. She hated cooking, but she learned to do certain meals for Thanksgiving and Christmas, certain traditional things, but we had so many family members who came in to cook, sisters and cousins, I just learned from so many people putting their hands in the pot and doing this and adding that. There were so many influences for me. My wife comes from a great cooking tradition, too — it’s just something you grow up in here. 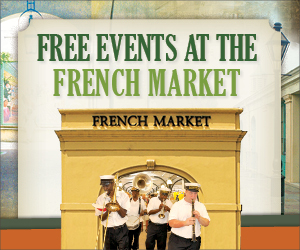 Your palate gets very refined from eating all the different dishes from different Creole families all over the city. You’re going to get a consistently good palate and you’re going to recognize the Creole of Color cooking tradition. At home, I do a lot of grilling, a lot of smoking, a lot of gumbos — I just did a gumbo last night — and we did some butter beans with some smoked sausage. Simple things. Paneed meat, in the Creole cooking tradition, can be paneed liver or paneed veal — to panee means to bread. I use Italian-seasoned breadcrumbs. Me, personally, I’ve always enjoyed paneed meat. My mom tricked me a long time ago. You know how it is to get a kid to eat liver, like liver and onions. But she would panee that liver — and oh, baby. It was so good. I kept eating that liver. I kept eating that sucker. The trick to a good sausage is your selection of seasonings and the quality of meat that you put in it. If you’re going to make a homemade hamburger, the worst you can do is go to the supermarket and get a lean beef. You might say, ‘Wow, that meat is so lean! It’s going to be perfect.’ But it’s going to be the driest hamburger in the world! So I always tell people — you want fat, because fat is what holds your flavor. I’m sorry — down here, fat is flavor. So we try to balance it. You don’t want it too fatty, but you want it fatty enough so you get the flavor. You hear a lot about the seasoning that goes on in New Orleans, but you don’t want to put too much. A little black pepper, a little salt, some fresh seasonings — green onion, bell pepper, and celery — you mix that up, a little onion, and you let those seasonings give you what you need. Directions: Mix egg and milk in a shallow container, beating it vigorously. Remove casings from the alligator sausage (if any) and shape four patties with the meat. Dip each patty in the egg-milk mixture, coating both sides. Place bread crumbs in another shallow container and place each soaked patty into the bread crumbs, coating both sides. Pre-heat enough vegetable oil (about 1/2-inch deep) in a frying pan to 350 degrees. Fry two patties at a time, trying to keep the temperature above 325 degrees, until golden brown and cooked all the way through (cut one open to check), 3-4 minutes on each side. Cook grits, according to directions on box. Mix in cheese, cover and let melt. Stir in salt and pepper to taste. Enjoy!